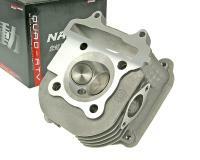 This is our Naraku Performance 150cc enlarged cylinder head upgrade. 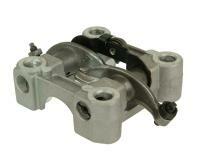 Complete Cylinder Head for 160-180cc GY6 engines. 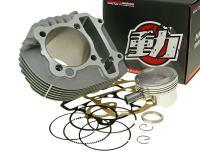 The cylinder head fits the NARAKU tuning cylinder sets [160-180cc] for Chinese GY6 125/150cc engines (scooters, quads and buggies.) 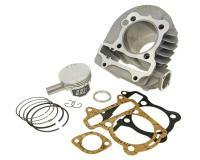 Tuning cylinder head with larger valves, larger ports and an enlarged 59mm combustion chamber. 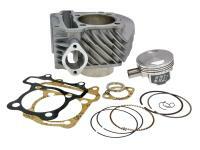 Get the performance you need with the Naraku Big Bore Cylinder Head! 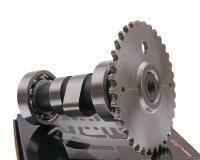 To increase performance even further, a modified sports camshaft with adjustable timing can be fitted. Naraku Scooter Parts for the GY6. 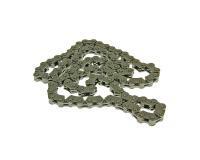 Please note: If purchasing this kit for the Sym 125cc scooters, please ensure your engine is the GY6 version (cylinder head stud holes have a distance of 63mm hole to hole, outside to outside measurement).